At the WonderCon panel for The CW's The Flash, producers revealed the titles to two upcoming episodes, one of which reveals when fans will finally get something that's long been teased. #TheFlash episode 20 is called "The Trap." Episode 21 of #TheFlash is called "Grodd Lives." While "The Trap" is one of those titles that could mean a lot of things, "Grodd Lives" is pretty obviously the payoff for the season-long series of teases that Gorilla Grodd is coming to the hit series. 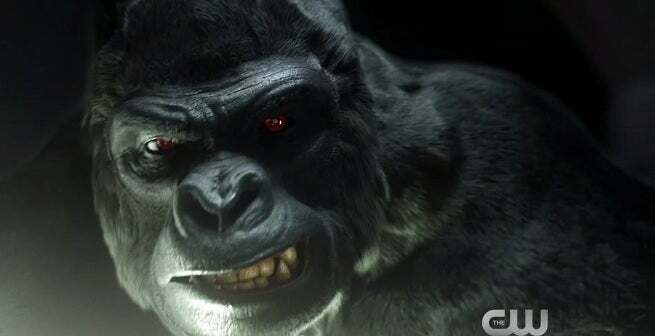 Grodd, a telepathic, superintelligent gorilla in the comics and part of a civilization of similarly-evolved apes, is instead a single gorilla apparently granted his abilities by the particle accelerator explosion on The Flash. His damaged cage was shown in the pilot and is one of a few things from the start of the series that producers said would be paid off in the show's final episodes this season. The Flash returns on April 14.